Helena Halme Author: Don’t use a smiley face on me! Don’t use a smiley face on me! I know what you’re going to say – you use smiley faces ALL the time! Yes, and I hate myself for it. I am a writer and should be able to express my feelings in words – that’s my business. 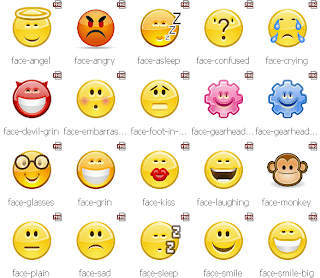 But these little icons for emotions are addictive. Once you start to use them, you cannot stop. Yet, they are oh, so naff! And they don’t really mean anything at all, do they? Besides, how often are smiley or sad emotions used to soften the blow of a negative email? Like when you are cancelling on someone, you often see ‘Sorry L ‘ when ‘I’m sorry’, would've been enough. Then there are the variations; the winking smiley face ;-). This is my particular weakness; I am a sort of a winking person as a whole. Or the glasses smiley face 8-) (which I should really use). I actually prefer these slightly more adventurous icons, because at least there the author of the message has exercised a modicum of creativity. I shall endeavor not to use any smiley faces or other emotions in my messages in the future. And I grant you permission to tell me off as soon as you see a smiley face from me!